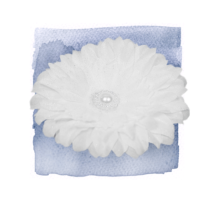 White sunflower hair clip is sprinkled with glitter dust and finished with a center pearl perfect for any LDS Blessing or Baptism. 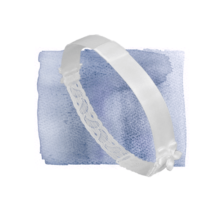 Can be worn alone or attached to a White Elegance headband. 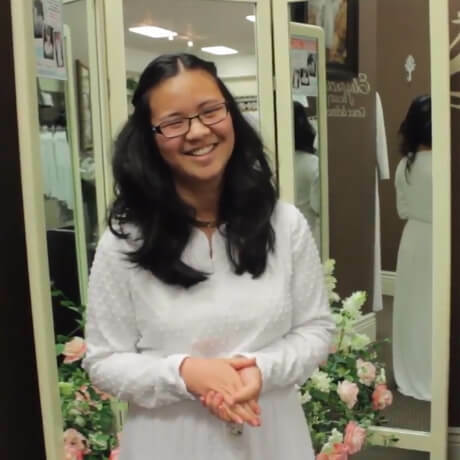 Adjustable, satin and stretch lace headband made specifically to hold any White Elegance flower and bow clips. 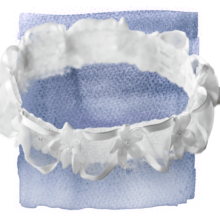 Sheer stretch lace, ribbon and flowers baby headband. 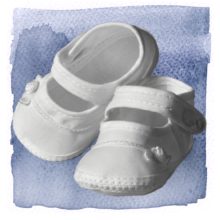 Batiste infant girl’s shoe with side bow and button closure. 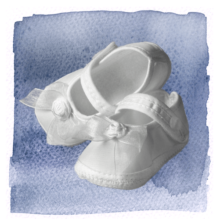 Infant girl’s shoe with delicate single rose set in an organza bow. 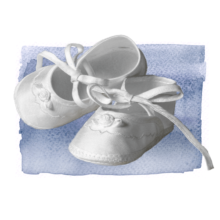 These beautiful, delicate baby shoes are an heirloom piece you will keep for generations. 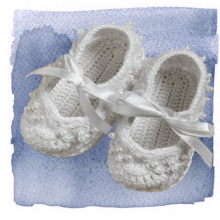 Finely crocheted cotton is combined with satin ribbon, tiny sequins and pearls for an exquisite addition to any LDS Blessing or Christening. One Size: New born to 3 months. 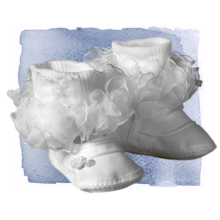 Cute, ruffled, organza socks. Sizes: 3/4 0-6 months, 4/5 6-12 months. Sweet as can be socks with lace ruffles. Sizes: 0-6 months, 6-12 months. Delicate dupioni shoe with tie and tiny flower on toe. Sizes: 0 NB-6 weeks, 1 6 weeks-3 months. 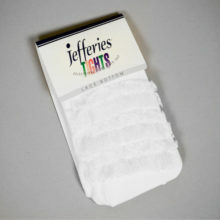 Adorable, infant white tights with a ruffled bottom. 100% Nylon. Sizes: 0-6 mo., 6-18 mo., 18-14 mo.